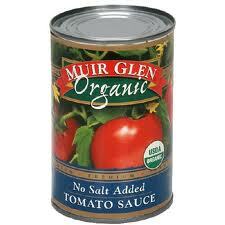 For any recipes I make that call for tomato sauce, I really prefer to use a low sodium or no salt added brand (Muir Glen Organic is my favorite!). It's amazing how different a recipe can taste when you start with a sodium rich base. Heat sauté pan to medium heat. Add olive oil and onion and sauté until onion is translucent; about 10 minutes (stir every few minutes, reduce heat if onion starts to brown). Add garlic to pan and sauté for 30 seconds. Add all remaining ingredients to pan. Reduce heat to low and simmer 45 minutes to an hour. Enjoy!